I use to swear off acrylic nails but lately they have been very common in my life. I had gotten my nails done a few times. The first time I ever got them was when I was 15 for my traditional quincenera and I HATED them! They were hard to work with, even if I tried to get the shortest length they could give me & not to mention they ached! So for you ladies who are barely trying out acrylic nails or are thinking about it, let me tell you a little about my experience with them. The first time you get a set they will ache. I don’t know if it’s just my nails that are overly sensitive but once I had gotten a new set after being on a hiatus for a few months (or more) they ached for days. I think it was just my nails trying to settle in with the new nails, but be forewarned. Please don’t go in thinking you can get the same quality at a different nail tech than you did the last. So please don’t assume they will all be great, and also don’t swear acrylics for life, because one nail tech messed it up. I have had okay nail techs, good nail techs, and great ones! I also want you all to know that expensive nails aren’t always going to be better than a less expensive nail. I have gone through many nail shapes since I started this nail journey and I have learned that not every nail shape suited me very well. I have learned that a square tip is not my friend, I don’t know why but I would get them over and over again and I would always hate my nails. I am currently enjoying a coffin tip and I also liked a slight pointed/ round tip, much like the stiletto, but not quite pointed. Down below I have left a diagram from eyeheartpolish.com that easily illustrates the different nail shapes. This goes back to what kind of nail tech you have (great or not so great) Depending on how your nail tech applies the acrylic and how well their skills are on this task, the lifespan of your acrylic nail will depend on your nail tech. 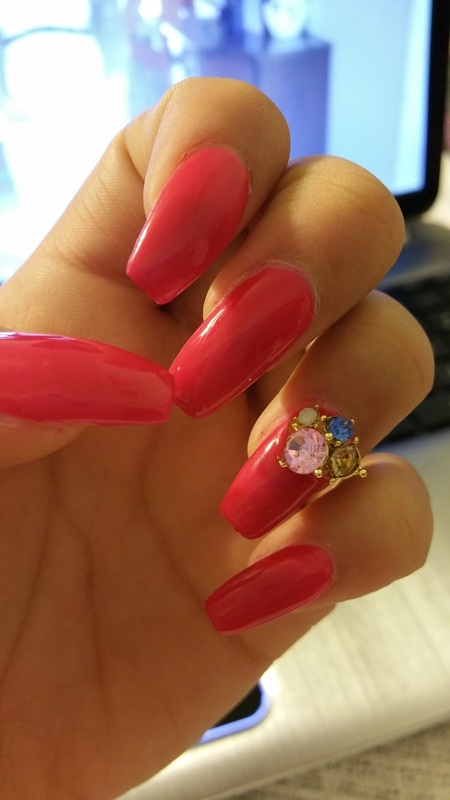 I use to get my nails done and within 3 weeks my acrylics were chipping off, the charms were falling off one by one, and the color was becoming dull; I have switched nail techs and my color never fades, my charms will come off after a month and a half, and as for them chipping, this will not happen until week 5. This amazes me because my acrylic nails wouldn’t normally last this long, but thanks to a great nail tech, THEY DO! These are just a few things I’ve learned about acrylic nails in the past year or so that I’ve gotten my nails done. I hope you find this helpful or helps you understand a little about acrylic nails!